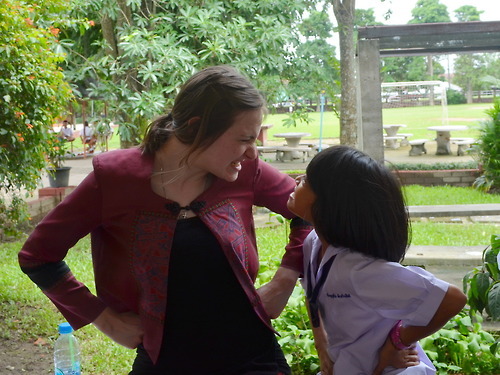 Ellie Livermore was our Student Leader from Manchester Metropolitan University this year in Thailand, she volunteered with VESL in 2010 and was able to return to Thailand this year as a Student Leader, here she reflects on her experience. When the opportunity to be a VESL student co-ordinator came up, it was too good to miss! I relished the idea of getting more involved with VESL in a new role – one that offered both the opportunity for me to gain lots of new skills, as well as going back to a country that had inspired me so much. The two stages involved in being a student co-ordinator are very different: the recruitment and preparation of volunteers and being an in-country support. For me the recruitment and preparation phase were all quite new. We organised several VESL information days, and I interviewed all the applicants – which could be quite intimidating as I was younger than a lot of the people applying!Once I had a team I organised meet ups and a teaching workshop to help prepare them for the classroom. I was quite difficult getting everyone together, especially as we were a big team (10 volunteers in total), but I remained in regular contact with everyone. The second phase – the nerve racking, exciting bit – going to Thailand! On arriving in Bangkok I was filled with a feeling of ‘Oh my goodness, why have I come here!’ Being alone after a long journey can take it out of you and my first problem was that I couldn’t contact any of my volunteers! The following day waiting in the airport to check in for the flight to Chiang Rai, I couldn’t for the life of me understand why only one volunteer had shown up and what a disaster it would be if they all missed the flight. It turned out that they’d all turned up even earlier than I had and had been sat in the departure gate the whole time!Seeing my host mum again in Chiang Rai was brilliant! We had a really good relationship the first time I had visited 2 years before, and she and Nueng – the in-country co-ordinator – had stayed with me and my family in Norwich when they had visited the UK, so it was like going to see family. After the orientation the volunteers were off! Each pair or three went off to their projects with their hosts, leaving me to visit my old school and teach there for a few lovely days amongst all the familiar welcoming faces, teachers and students alike! It was very different going back for several reasons. The relationships with my host family and the teachers were even warmer now that they knew I really did like their country. In my host household I was mucking in with the cleaning and was given rice for breakfast every day (something they hadn’t done last time). 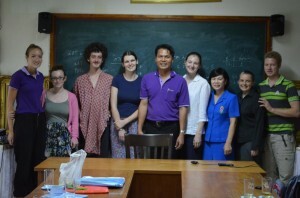 It was like being an honorary Thai instead of a ‘Falang’ – a foreigner. Travelling round the projects was fascinating and great fun. First you have to get to grips with the public transport so you’re not a burden to your hosts. 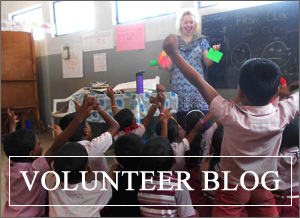 Once you’re at the schools and with the volunteers it’s very different to being there for the first time. You draw on your own teaching experience to give advice to volunteers who are just starting off, you realise just how different all of the areas in Northern Thailand are and you’re seeing many different places very quickly. One thing that didn’t change and yet still didn’t cease to amaze me was the amazing hospitality of the Thai families. Luckily my team experience no major issues, and I can gladly say that MMU’s volunteers did a great job teaching in the 5 schools they were in across Northern Thailand. The second visit to Thailand was very different to the first… it was even better! Interested in being a Student Leader yourself? Click here for more information.